I’ve been a reader of Lucky magazine since 2001 and very few times have I ever seen anything plus size in their magazine. Last week I tweeted to @luckymagazine that they needed to show more plus size clothes and models. Little did I know that they were already a step ahead of me. 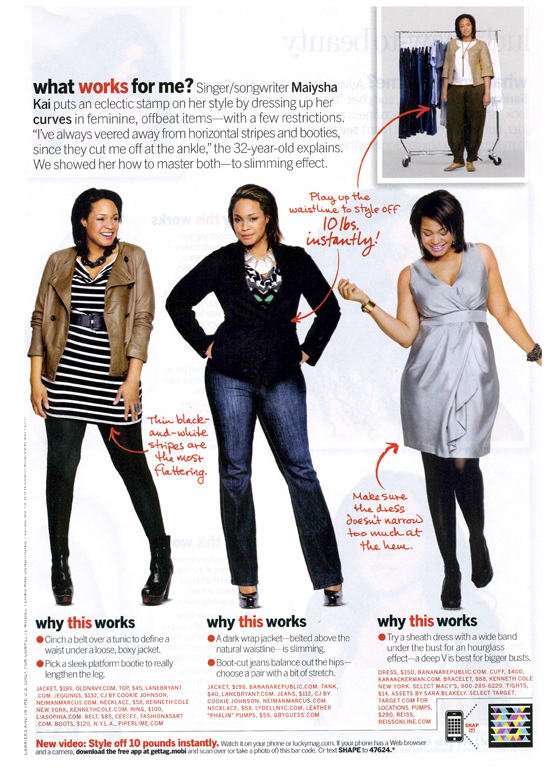 Last Friday I picked up the January issue of Lucky magazine at the newsstand and I was shocked to see plus size model Maiysha in the “What works for me” column of the magazine. They dressed Maiysha in pieces from Lane Bryant, Faith21 Plus, and Banana Republic. While she looked great and the magazine did offer good styling tips to flatter your figure, it would be nice to see a feature that reads how to embrace your curves stylishly. If you have large round hips show women how to embrace them and not hide them. I am a big believer in baby steps and I think this was Lucky Magazine taking baby steps. I’m also wondering could Lucky be turning over a new leaf since they have a new editor? Will there be more plus size looks to come in future issues or was this just one feature to pacify us?